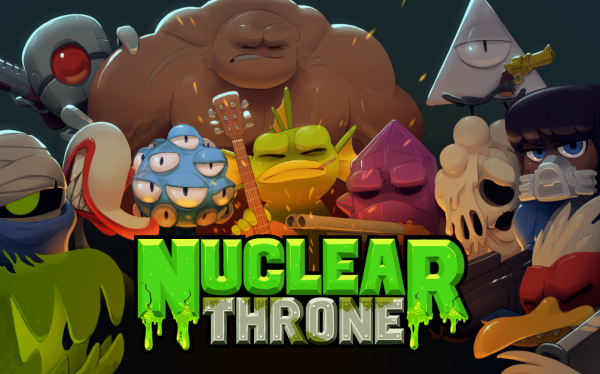 Nuclear Throne is a post-apocalyptic roguelike-like (roguelite) top-down shooter. Its filled to the brim with irradiated mutants to blast, tons of powerful weapons (that can sometimes do more harm to you than enemies), and fast gameplay. What started as a curious playthrough or two evolved into a slight addiction over the proceeding weeks. My goal was simple. I wanted to reach the Nuclear Throne and complete the game. The slight issue became that the game is pretty difficult. Nevertheless, I pushed myself further and set goals each time I made it that one step further. Unlocking new content, discovering secrets, and developing strategies. While the game itself seems shallow on the surface, especially coming from and playing things like Enter the Gungeon; it takes awhile to discover the wealth of content that the game actually offers. While one may fault the game to hide a lot of this content away through cryptic means, it does add a lot depth for those seeking more content after getting their fill of beating the game, which I did end up doing (multiple times in fact). So, about that difficulty thing; well, there’s no denying it’s a punishing game. In fact, many of your deaths will eventually feel like they are out of your control, especially once you get into the later levels. The procedural randomization that generates the layouts can feel unfair at times. You do get better at expecting certain things and developing strategies against these rare RNG nightmares, but it’s never in your full control. Luckily, I think that’s where the faults end, at “rare unfair spawns”. The rest of the game is top notch. The audio, the visuals, the style, the atmosphere and world it creates through its quirkiness. Although its sadly locked at 30 frames per second and in a 4:3 aspect ratio, these become very small nitpicks after playing it a bit. While I was obviously late the party with this one, I ended up really enjoying the speed and frenetic gameplay that Nuclear Throne offers, even over its successors in the genre. This entry was posted in Reviews, Video Games.